Cinematic greatness comes in many shapes, forms, and running times. Not all of it is spread across the length of an entire movie—sometimes it’s crammed into one moment, an isolated pocket of excellence. Other times it shines brightly for a few minutes, illuminating the power of what’s around it. Before counting down the best movies of the year (tomorrow! ), The A.V. Club film staff presents its favorite scenes—the ones that work in isolation, as standalone triumphs, and the ones that gain power through context. The multi-selected favorite is below, followed by individual picks from each of our regular contributors. There will be spoilers, so beware. In Before Midnight, the third installment of what’s become a profound, decades-spanning portrait of a romance, Jesse (Ethan Hawke) and Celine (Julie Delpy) do something we’ve never seen them do before: They have an argument. Not a little spat, or a cute disagreement, or a heated debate, but a real knockdown, drag-out fight. Holed up in a Greek hotel room for an arranged night of romance that’s gone south, the lovers spar as only two people who really know each other can. For those already in love with the characters and the sweet, revealing conversations they had in Before Sunrise and Before Sunset, watching the two tear into each other—drumming up old resentments, broaching sensitive subjects—is a bit of a downer. (Are we watching a sequel to an indie date movie or a remake of Contempt?) But the scene itself, long and loaded and often very funny, is also a marvel of acting and writing. Hawke and Delpy, who penned the film with director Richard Linklater, don’t just nail the way longtime lovers fight (the escalation into conflict, how anger can fade to a single ember and then grow back into a raging inferno with one poor choice of words). They nail the way these lovers would fight by using the same tools of lightly philosophical conversation established in those earlier, less acrid talkfests. For 20-some minutes, Before Midnight is a buzzkill, but it kills buzzes with purpose: Seeing Jesse and Celine in war, as well as love, only deepens our understanding of their swoon-worthy story. What’s your 2013 pop culture gift to the world? Leaving little doubt as to who’s the weak link in their partnership, James Wan’s second feature without his Saw screenwriter Leigh Whannell is a startling advancement, especially over the undisciplined mess of Insidious. Deliberately evoking the slow-burn horror of the 1970s, The Conjuring achieved most of its substantial scares through old-fashioned technique and in-camera effects. The “hide and clap” sequence, in which a haunted family coaxes out a reluctant spirit with a children’s game, is a masterpiece of escalating tension, capped with a simple but wildly effective bit of misdirection and a delightfully jarring shock. The movie’s success was proof that a horror film need not blow out its CGI budget to knock audiences out of their seats. Stoker may have been a tad over the top, even for fans of Park Chan-wook’s operatic style, but the incestuous piano duet between Mia Wasikowska and her sensuously creepy uncle Matthew Goode was at once luscious, lurid, and magnificently restrained, channeling the pair’s repressed longing into a four-handed flourish. The Gothic abstraction of Philip Glass’ original music perfectly evoked the emotions surging within these cold-blooded bodies, conveying both passion and perversion at once. The late, great cinematographer Harris Savides was justly proud of the haunting single take that encapsulates The Bling Ring’s themes of melancholy envy and grotesque entitlement. Filming from afar, the camera watches as the movie’s teen burglars work their way through the translucent glass-and-steel box that is reality star Audrina Patridge’s house, moving from room to room like ants in a cutaway maze. It’s a rare moment of beauty in a film that seems to deliberately reject the superficial pleasures of Sofia Coppola’s earlier films—and even then, it’s seen only from a distance. Sniff if you will at this tearjerker about an elderly curmudgeon (Terence Stamp) who takes the spot in a senior’s chorus vacated by his late wife (Vanessa Redgrave). But just try to keep your eyes dry during the scene where the dying Redgrave serenades the group with Cyndi Lauper’s “True Colors.” Casting actors of such stature in a middlebrow weepie may seem a waste of talent, but Stamp and Redgrave single- (or double-) handedly elevate the material with committed, heartfelt performances that outmaneuver the script’s predictable turns. Shot entirely on and around a fishing boat off the coast of Massachusetts, the experimental documentary Leviathan occasionally shows human beings, but they’re nearly as anonymous as machines in a factory. The film’s real stars are the seagulls that relentlessly follow the boat in hopes of snagging an easy meal from the deck. The film’s astonishingly eerie climactic movement sees the camera repeatedly plunge beneath the waves and then surface to a vision of hundreds of white gulls moving across the jet-black night sky like a squadron of fighter planes. Somehow, it then rises to join the flock, providing a vertiginous view from overhead as individual birds dive into the water in search of food—all of this accompanied aurally by their constant cries and the boat’s thrumming engine. Monochromatic and vaguely sinister, the spectacle has a forbidding grandeur that chills the marrow. Tom Hanks has been highly praised for his performance in the title role of Captain Phillips, but the bulk of his work in the movie is best described as solid, professional, and workmanlike. What shatters the soul is what he does in the last few minutes, once the hijacking has been resolved and the story is over. After so many years of watching cinematic heroes blithely handle any trauma that comes their way, seemingly with no ill effects, it’s surprising to see one who immediately goes into full-fledged shock, utterly unable to process what just happened to him. Hanks flawlessly and fearlessly conveys the overwhelming sense of horror that belatedly wallops Phillips, making it impossible for him to answer simple questions from the medics or even control his spasming muscles. Yet, it’s also clear—and this is the wonder of Hanks’ performance in the scene—that Phillips is conscious of being incapacitated and is desperately struggling to get hold of himself, without success. No Hollywood movie in recent memory has introduced such a grim note of stark realism that has no narrative function, serving only as a pointed rejoinder to false heroism. Set among an all-female company performing Shakespeare’s Twelfth Night, the Argentine romantic comedy (of sorts) Viola deliberately blurs the line between life and theater—never more powerfully than in one lengthy rehearsal sequence. Two actresses in street clothes casually run lines from Act I, Scene V, in which Viola, disguised as a man, gradually seduces Olivia (on behalf of Duke Orsino). They perform the scene once, then twice, and it starts to seem like overkill: Okay, we get it. Nice writing, Bill. But director Matías Piñeiro has merely been establishing a clear context. At a certain point, the actress playing Viola (Agustina Muñoz) starts circling back to the most romantic verses rather than letting the scene play out, forcing the actress playing Olivia (Elisa Carricajo) to follow suit. With each iteration, the scene gets shorter and shorter, as Viola reboots it still earlier. At the same time, Piñeiro’s camera, which has been constantly repositioning the women’s bodies in the frame, subtly closes in. It all builds to the year’s sexiest and most sudden kiss, when “Olivia” finally can’t take it any more and just grabs “Viola” by the neck. Few contemporary filmmakers are as enamored of the tracking shot as Alfonso Cuarón, who’s been staging elaborate, virtuosic, how’d-they-do-that? long takes since at least Great Expectations (1998). Prior to this year, the director’s most showboating shots could be found in Children Of Men. How, his fans had to wonder, would he ever top the inside-the-car sequence or the war-is-hell climax of that dystopian actioner? The answer, it turns out, was to free his camera of terrestrial limitation—to invent a scenario in which it could move on all axes, gliding in all possible directions. Clocking in at a whopping 12-and-a-half minutes, the opening shot of Gravity finds Cuarón marrying his affinity for fluid, voyeuristic cinematography to some of the most remarkable CGI in movie history. As our big, blue marble rotates silently in space, a tiny speck drifts into view from the upper right side of the frame. It grows larger as it moves closer, eventually revealing itself to be a spacecraft, and soon Cuarón is orbiting the astronauts floating around the vessel’s underbelly. The scene, a perfect introduction to these characters and this gorgeous, weightless environment, eventually erupts into disaster-movie chaos, with Cuarón finally cutting—intuitively, cathartically—at a moment of terrifying release. All of this may be less formally impressive than the big set pieces in Children Of Men, if only because much of what’s being filmed isn’t actually, physically there, but it’s no less astounding to gawk at. Inside Llewyn Davis is a refreshing change of pace for the Coens, in part because it finds these famously irreverent brothers showing a little reverence for once. Their affection for the ’60s folk scene is evident in every one of the film’s musical performances—even, as it turns out, the one that’s supposed to epitomize the crass commercialism the title character considers himself above. 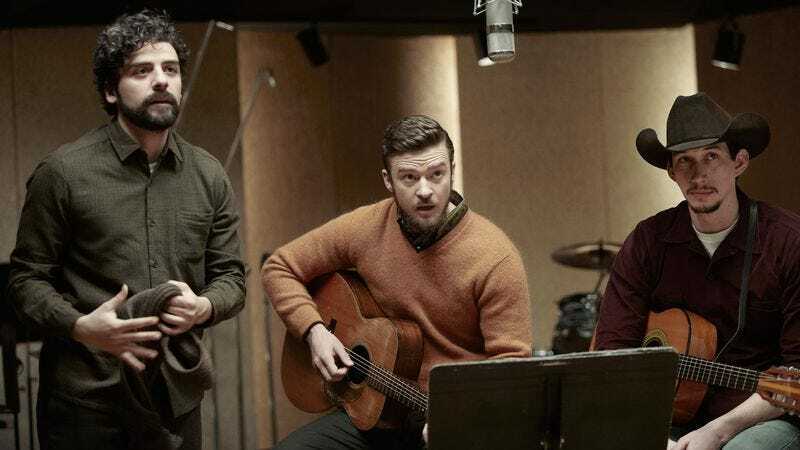 In serious need of a paycheck, dirt-poor troubadour Llewyn (Oscar Isaac) agrees to play session musician for his “careerist” friend, Jim (Justin Timberlake), who’s written a kitschy novelty song called “Please Mr. Kennedy.” The scene of them knocking out the tune in a recording studio is a total gas, in part because of the supremely goofy, baritone back-up vocals of a third musician, a Jewish cowboy played by Adam Driver. But it’s also a weirdly joyful moment in an otherwise deeply melancholy movie. Llewyn, like the Coens, knows that the song’s a joke—a phony and nonsensical protest anthem—but as a natural performer, he can’t help but lose himself in the process of playing it. It helps, of course, that “Please Mr. Kennedy” is also infectious. Had the Coens wanted the song to be both stupid and unlistenable, they wouldn’t have put T-Bone Burnett on the job. Released at the very beginning of 2013, the supernatural thriller Mama earned mostly polite reviews and solid box-office before disappearing like an exorcised spirit from the pop-culture conversation. This is understandable. In most respects, it’s a solid, unremarkable genre movie, notable mainly for being a hair better—if much better made—than the usual January junk. But the film contains one moment, a conceptually nifty “gotcha,” that lingers in the mind long after the specifics of plot and story have faded. In Mama’s best scene—it’s really almost half a scene, at least in terms of length—director Andrés Muschietti locks his camera on the top floor of the family home, using a wall to divide the frame in half. On the right side, the younger of the film’s orphan children (Isabelle Nélisse) plays tug-of-war with someone offscreen. Viewers are meant to assume that her playmate is her older sister (Megan Charpentier)—until, of course, the other girl emerges from around the corner and into the hallway on the left side of the frame. Who, then, is tugging on the blanket, just out of sight? Amping up the suspense by having the girls’ reluctant, surrogate mother (Jessica Chastain) wander obliviously down the hallway, while a monstrous shadow suddenly teases the identity of the unseen “person,” Muschietti demonstrates how—with the right control of composition and pacing—what the audience can’t see can be just as powerful as what it can. It’s a great moment in a decent movie, provoking goosebumps of both fear and pleasure. It comes right in the middle of the film and functions as a sort of thematic tether. After defending himself against a drunken, abusive plantation foreman played by Paul Dano, Chiwetel Ejiofor’s Solomon Northup is hanged by the neck from a tree branch—his feet just close enough to the muddy earth to keep from strangling—and left there for an entire day, suspended between life and death. Director Steve McQueen holds on Ejiofor’s twisting, struggling body for a very long time. Often in movies, long takes are didactic, a way for a director to underline a moment and insist too firmly on its dramatic and artistic significance. That isn’t the case here. We need to feel the time pass, need to sit with Northup’s glottal sputtering and imagine—really imagine—what such a punishment might be like. Then, in an inspired stroke, McQueen prolongs the scene even further by cutting to wider and wider shots, each taking in a little more of the surroundings (and leaving Northup smaller in the frame): a washer-woman passing by, able to spare only a brief, pitying glance; children playing under a nearby oak, their laughter just slightly more hushed than usual; the field beyond, where the other workers carry on picking cotton as before. It’s the inability of Northup’s fellow slaves to do anything, and the speed at which they must reconcile themselves to that fact, that wounds most. The scene functions metaphorically, too. Throughout the film, Northup is suspended between worlds: too black to fit into white society, too “white” (meaning, in this context, too educated) to feel one with his fellow slaves. He’s a man always in-between, and his only means of surviving is to stay forever on tiptoe, perfectly balanced, perfectly stuck. David Gordon Green’s heartfelt Prince Avalanche, a sort of love story about two screw-ups (Paul Rudd and Emile Hirsch) painting lines on a semi-deserted highway, is ostensibly set in 1988, in the wake of a fire that claimed over 40,000 acres of Texas woodland. In reality, the terrain being filmed burned in 2011 and is just now starting to recover. (The trees remain bare, but the forest floor is stunningly verdant.) Early in the film, Alvin (Rudd) happens upon the charred remains of a home and discovers an old lady in a pink sunbonnet sifting through the rubble. Alvin says hello and simply listens as the woman tries to impart something of her loss. “All these things are memories,” she says as Alvin plucks some forlorn object from the ground. “Sometimes it feels like I’m digging in my own ashes.” Everything about this brief sequence is moving: the woman’s sad eyes, her trembling smile, Rudd’s unaffected, sincere engagement with her. Not an actress, the woman’s name is Joyce Payne and the remains she’s sifting through used to be her house; Green and his location scouts simply happened upon her and asked if they could put her story into the movie. (She makes a few more appearances, all wordless.) This documentary-style interest in the lives of real people used to be a hallmark of American fiction films circa the ’60s and ’70s (think The Sugarland Express, California Split, Harry & Tonto, etc. ), but it has all but vanished now. It’s a shame, because it was a lovely and honorable tradition, and it kept the movies grounded in time and place. Long after many of this year’s most acclaimed performances have faded from memory, Joyce Payne’s “performance” remains with me. A documentary that not only details the present-day circumstances of men who helped carry out the 1965-1966 genocide of “communists” in Indonesia, but also has those killers reenact their crimes for the camera in the style of their favorite gangster films, Joshua Oppenheimer’s The Act Of Killing is a mesmerizing spectacle of past atrocities refracted through a media lens. That process reaches its apex in the film’s final scene (SPOILER ALERT), in which mass murderer Anwar Congo returns to a rooftop where, earlier, he’d proudly demonstrated the strangulation-by-wire techniques he’d used there on his victims. Now troubled by his lethal behavior, Congo quietly stalks his killing ground until, suddenly, he becomes overwhelmed by a deep, guttural retching that he can’t contain—and which, more stunning still given its severity, produces no regurgitation. The result is an almost unbelievable, and overwhelmingly powerful, image of a man subconsciously compelled to physically expel the horrors inside, only to find that attempt unsuccessful. It’s a portrait of an irredeemable man damned to live out his final days without release or escape from his own evil. An incisively written and staged drama about separation, resentment, regret, and the consequences of reckless behavior, Asghar Farhadi’s The Past is also—in its story of the trouble that arises when a husband returns home to sign divorce papers so his wife might remarry—about the way the fundamental inability to escape that which has come before. That last notion is expressed in the film’s heartbreaking single-take finale, which (SPOILER ALERT) finds Tahar Rahim’s dry cleaner visiting his wife in the hospital, where she’s being kept alive on life support while in a coma brought about by a suicide attempt. Wracked by equal measures of guilt, sorrow, and longing, the man says farewell and exits the room, and Farhadi’s camera trails him down the hallway where, unexpectedly, he turns around and returns to his wife, whose hand he grasps while asking her to squeeze his finger if she can hear him. Farhadi’s camera pans down to their intertwined hands, waiting to capture some movement, and then freezes—a closing sight that encapsulates the way in which the past, no matter how painful, also remains something to which one can’t help but cling. Carlos Reygadas’ 2007 Silent Light began with a single-shot movement from the heavens to the Earth—a masterful opening that the director matches in Post Tenebras Lux. With his camera positioned close to the ground, Reygadas commences his latest with the sight of a young girl (his real-life daughter) in a muddy rural Mexican field that’s encased by trees and mountains, and populated by a pack of dogs that race around her tiny frame. Randomly wandering about the area while calling out names that, it will later be revealed, are those of her relatives, the girl is presented without context. But Reygadas and cinematographer Alexis Zabé shoot her with a heightened, stylized naturalism—rich with clarity and color, in 4:3 full-frame shots where the sky is enormous and the edges of the screen have gone blurry—that captures her wide-eyed, confused innocence. As the scene proceeds, day turns to dusk and dusk turns to a thundering, stormy night in the process symbolically conveying the transitions to come in Reygadas’ semi-autobiographical tale. A collection of alternately well and terribly acted scenes that never amount to more than a clichéd tale of vigilante vengeance, Scott Cooper’s Out Of The Furnace is nonetheless enlivened by a brief, heartbreaking reunion shared by a woman and her ex-boyfriend, shortly after the latter has finished serving a drunk-driving prison sentence. On a steel bridge, Russell (Christian Bale) makes a plea for Lena (Zoe Saldana)—who’s now seeing the local lawman—to come back to him, promising her that he’s ready and eager to start a family. Lena, alas, is pregnant, a confession she chases by instinctively covering her quivering mouth with her hand, as if in a vain attempt to stymie the words she’s just uttered. Bale’s reaction is just as affecting, with a smile that’s simultaneously genuine (because he wants the best for her) and false (because it means his dream of being with her is dashed). It’s a scene of small but lingering tragedy and a rare moment of genuine pathos amidst the rest of the film’s dull, gray macho brooding. David Twohy’s Space-Conan-with-a-side-of-Parker anti-hero (Vin Diesel) stays off screen for most of the middle third of Riddick. Left for dead on an inhabited planet, Riddick has realized that his only way out is to lure in some bounty hunters and steal their ship. Two rival teams arrive, eager to collect the bounty on his head, and proceed to get picked off one-by-one by their target, who has at this point been living on the planet for months or possibly even years. He is a predator, glimpsed only briefly as he drags off the bodies of his would-be captors. Twohy is one of cinema’s best pulp storytellers, able to craft self-contained genre stories around thoroughly unlikable characters. One of the best—and funniest—examples of this comes midway through Riddick, when the bounty hunters return to their outpost to find the words “Fair Trade” scrawled on their storage locker, which has an explosive charge built into its combination lock. Could Riddick have re-set the combination, or is he merely tricking them into thinking that he booby-trapped the locker? And what does “Fair Trade” mean? The bounty hunters try to reason it out with logic, but soon descend into squabbling. Tension mounts and guns are pulled. The scene—almost its own movie-within-a-movie—is an object lesson in how to generate suspense without giving the audience anyone to root for. Keanu Reeves’ directorial debut features some of the best fight scenes in recent memory. However, the sequence where Tiger Chen (playing a character named Tiger Chen) auditions for Reeves’ supervillain-like fight promoter Donaka is in a class of its own. Having just flown in from Beijing, Chen comes to Donaka’s ultra-modern Hong Kong office in his best job-interview suit. He is taken into a room with no furniture, gray walls, and a carpeted floor. There is a white line drawn on the carpet, and a mirror hangs on the far wall. A woman’s voice asks him to state his name and stand on the line. Static shots place Chen in the center of the frame, emphasizing the size and emptiness of the space. Seemingly out of nowhere, an assailant (Jeremy Marinas) appears, and the camera begins to move with the fighters. Its movements are timed to theirs, and match them in force—every lunge, spin, and kick. It’s a remarkable piece of choreography, both in terms of fighting and camera movement. Chen is wiry, smaller than the muscular, broad-shouldered Marinas, and the choreography emphasizes their weight difference instead of trying to mask it. As the fight escalates, Chen uses Marinas’ momentum against him. When Marinas lunges full-force, Chen grabs him and rolls, throwing his opponent against a wall and then gracefully resuming his fighting position, ready for the next lunge—all in a single take. The “catfish” scene, in which Reiner (Javier Bardem) describes a sexual encounter with Malkina (Cameron Diaz), which ends with her grinding against the windshield of his Ferrari, is far and away the most notorious moment in The Counselor. It’s also one of the few moments in the film when something is shown (at least in part) at the same time as it’s being described. Written by novelist Cormac McCarthy, The Counselor consists mostly of scenes where characters describe something unseen—or un-seeable—to a listener, usually the nameless Counselor played by Michael Fassbender. The best of these comes early on in the film, when the Counselor visits Reiner at his home. The two are sitting on a couch, talking business, when Reiner asks: “Do you know what a Bolito is?” What he proceeds to describe is a pocket-sized mechanism with a loop of wire “made out of some unholy alloy” that can be used to kill an unsuspecting victim on the street. It works slowly, with the loop first suffocating the victim, then cutting into their carotid, and then, minutes later, decapitating their limp body. The loop can’t be cut through, and the mechanism can’t be turned off. Of course, the device appears—in full, gory detail—at the end of the film, but it can never live up to Reiner’s bemused description. The Bolito is a plot point, but it’s also one of The Counselor’s important metaphors: something so evil that most people have trouble imagining it, or even imagining why someone would invent it. Merely glimpsing it means that you’re already too far gone. To Quaalude connoisseurs like Belfort and his business partner Donnie (Jonah Hill), the most sought-after high comes in the form of a triple-strength, pre-criminalization ’lude called the Lemmon 714. Late in the film, Belfort and Donnie decide to try some of Donnie’s stash, which he’s been saving for a special occasion. Believing (incorrectly) that the pills have lost some of their potency after 15 years in storage, Belfort swallows a handful. At a key moment, just as he realizes that he urgently needs to get home, the Lemmon 714s kick in. Belfort first finds himself unable to form words, then robbed of his fine motor skills and the ability to walk. The scene that follows is a go-for-broke piece of bizarre slapstick comedy, with Belfort trying to squirm and writhe his way out of a country club. Phones are useless, and stairs become an insurmountable obstacle. It’s the pièce de résistance of DiCaprio’s gonzo performance. The scene climaxes with an interminably long, unbroken shot of Belfort trying to open his car’s butterfly doors using only his feet. With this film and The Counselor, it’s been a banner year for weird, physically demanding scenes involving Ferraris.